There’s a large misconception many of us film aficionados fall into, and that’s that entertainment isn’t art. Every film is a work of art when you think about it because every film is so damn hard to make, it’s really a miracle anything gets made. 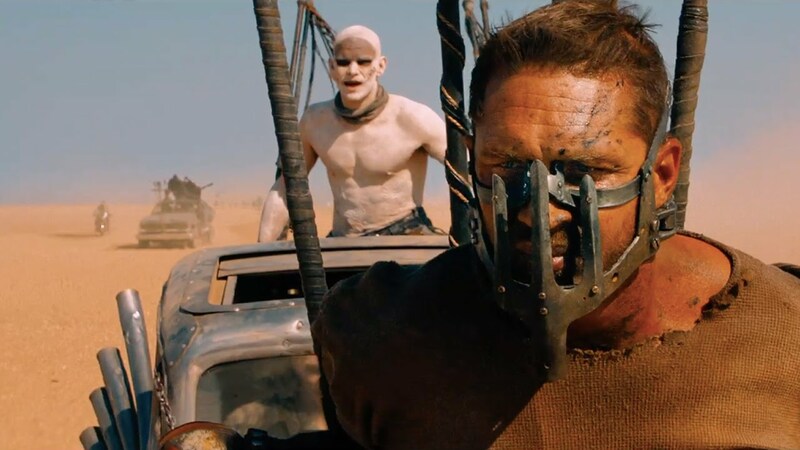 “Mad Max: Fury Road” is probably the greatest example of visually communicated story within action we’ve seen this decade. Actions that take place are punctuated by crucial story and character arcs that not only dazzle with spectacle but fuel an engine of world and stories that inhabit it. The pinnacle moment of visual flare comes in the sandstorm which increases the danger tenfold but also drops jaws in awe of the magnificent beauty of it all. This is the moment where they enter the eye of the storm, both literally and figuratively. The visuals of the film as a whole are remarkable not just because they’re amazing but because they show so much of what the film is telling. Now of course I have to get something shot by the great Roger Deakins on here. There’s almost too many moments in his repertoire to choose from but ultimately I’m choosing the image that comes back in my mind more than any other. Humanity has destroyed itself, whatever remains there of previous human kind is merely a faded memory. K is overtaken by a hellish orange color as he walks through the ruins of Las Vegas and becomes a dark, silhouetted figure. With no identity and no clear persona. Whatever humanity he seems to have is lost in the dark. This is a film with patience and understanding, it knows not to rush into its moments but rather take its time getting there and let us bask in the mysteries it has to offer. 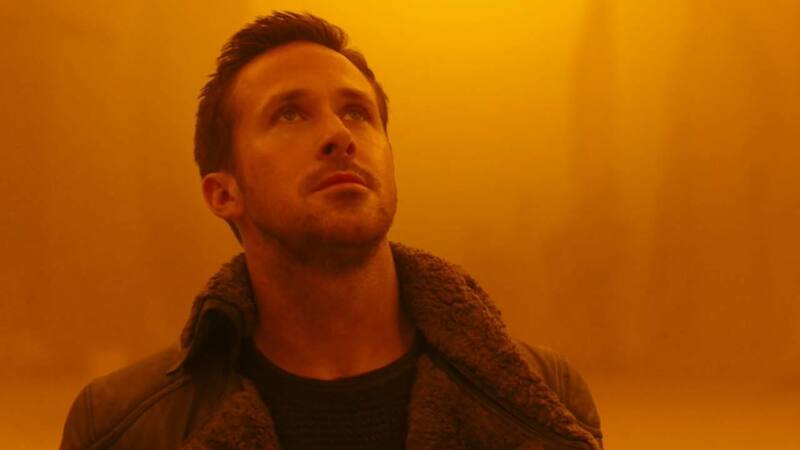 Just like the original “Blade Runner” there’s a lot to decipher when watching it but the reward is an incredible one. 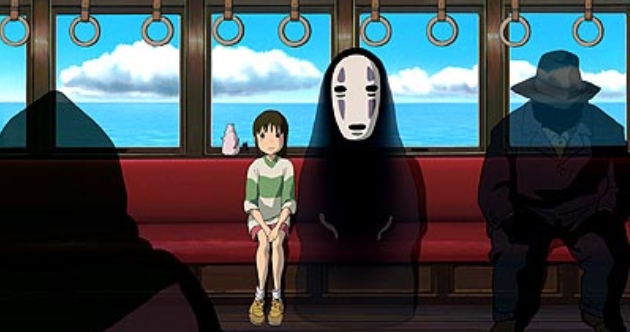 I find that this tends to be a lot of people’s favorite scene in “Spirited Away”, and for good reason. After all the insanity we’ve witnessed in this spirit world this is exactly what everyone needs. Sen has had her life threatened at almost every turn as she’s been held prisoner in this bathhouse where it seems that every living thing is trying to eat her. Likewise No-Face has devoured so many of the evil people who occupy this world that he’s become a greedy, self-consumed monster as a result. This moment isn’t the ending but it’s a meditation, a break away from all the madness they’ve been surrounded with. I think all of us have had a moment where we’ve sat down on a bus, a train, or in someone else’s car and we have a moment to let anything on our mind sink in as we have an opportunity to breath and think. Through these simple moments and basic visuals it goes from a great film to something truly remarkable. 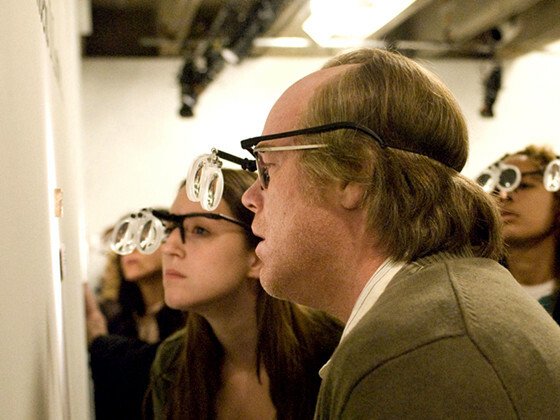 Charlie Kaufman’s masterpiece is nothing less than taking us on a journey through human life and experience. The final moment of his brilliant, chaotic vision is that of Caden walking through the remains of his gigantic life size set of New York City. As Caden walks through the remains of his fictional city after some sort of apocalyptic event he sees buildings he’s created that he literally filled with his life and projections. His art and his life have crumbled around him as he’s only gotten smaller as everything around him has gotten larger. It taps into our most primal fears of loneliness, isolation, and being forgotten. In a weird way it’s as beautiful of a death as you can conjure up. Nothing happens and yet everything is happening. 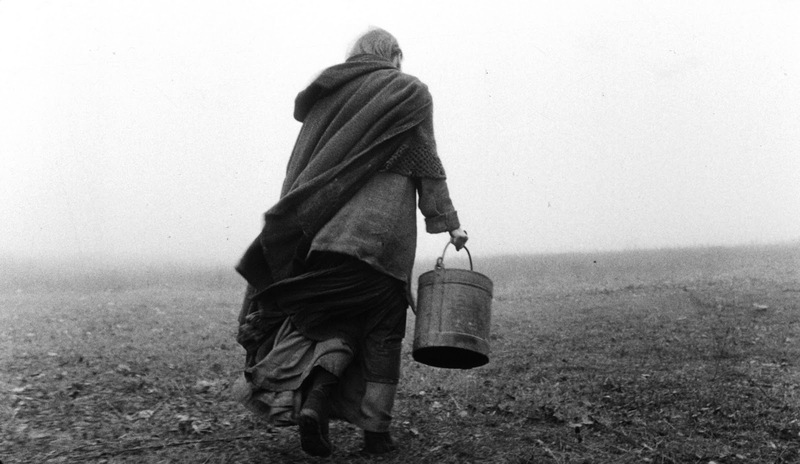 The film evokes the methods of Tarkovsky using long takes to draw out real time and makes us suffer the excruciating details of ordinary life. A couple lives on a farm, perform daily chores, and don’t do anything particularly remarkable. This girl goes out to fetch some buckets of water from their well, seems like nothing. But in this nothing we see everything that life is made up of: work, struggle, hardships, and labor. The screen is overtaken in a desolate white void that is their surroundings, the black and white beautifully adds to this effect. Wind is blowing hard in her face, leaves are falling all over the place, and she struggles to carry the buckets. In this one moment an entire lifetime is captured. Have you ever seen something so amazing you just stand still and feel like you can’t move? 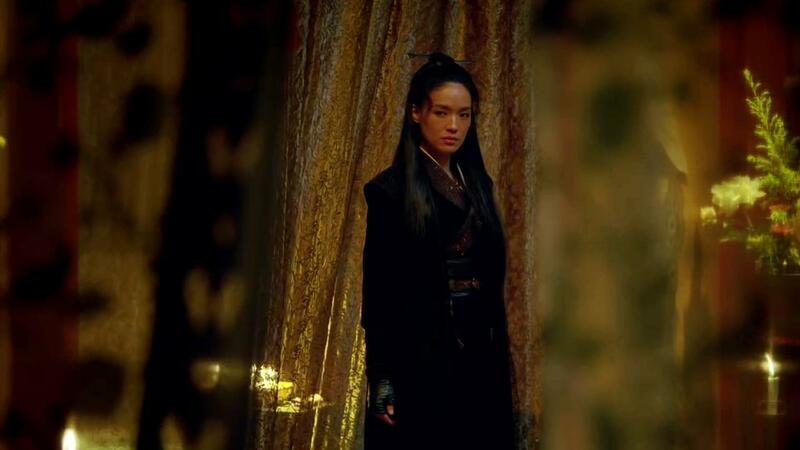 “The Assassin” is one of the most visually striking films of the century bar none, but this scene in particular is what takes my breath away. It’s funny because the film is mostly defined by its selective color palette of reds but the best moment is when the natural world swoops in and overtakes us. With one shot that stays for a solid 2+ minutes we sit isolated in time with this fog slowly overtaking the mountain. This is the kind of image one would normally associate with the kind of lore linked with Eastern culture and history, and it’s not hard to see why. The fog itself practically serves as a character and story itself. Drowning the characters in its beautiful yet haunting blindness, leaving them as figures in the light. It’s an incredible moment and one that shouldn’t be overlooked. 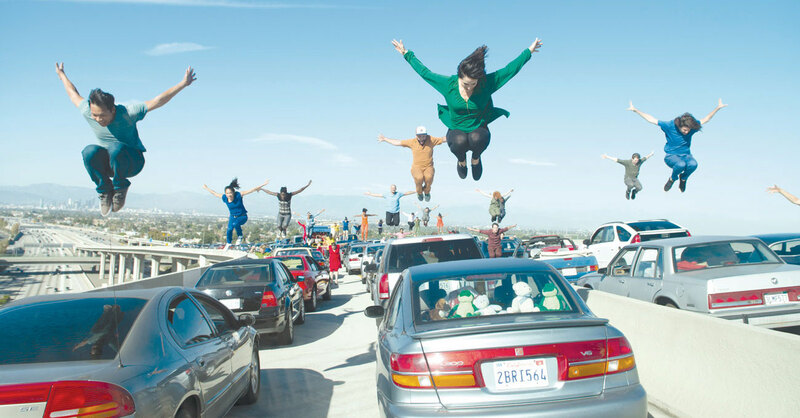 The ingenuity of “La La Land” was to pay tribute to a golden age of film. A time where stories were simple, emotions were easy and relatable, and magic would flare up the screen. “La La Land” as a whole serves as a love letter to this magic I speak of and lifted us up into the fantasy clouds of the classic musicals. There is no scene that better serves this than the finale in which dreams, fantasies, and tributes combine into one incredible package. Not only is this right in place with many of the fantasy dance sequences of the great musicals from “An American in Paris” to “Singin’ in the Rain”. But more over this is a collection of film history in one complete package from the great French works like “The Umbrellas of Cherbourg” and “The Red Balloon” to the irresistible chemistry of Astaire and Rogers. Damien Chazelle certainly gave us a modern spin on what makes an ageless film and just like the feeling you get at looking out at that magic hour you will likewise feel your heart fill up with a sense of awe at this wonderful scene. 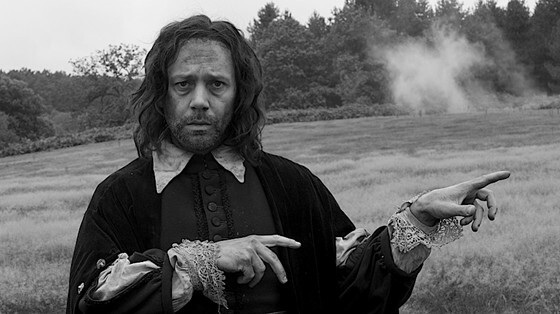 The film seemingly takes place entirely in the titular field but stretches across all fields of one’s imagination. This scene in particular has a logical explanation of a hallucination due to mushrooms but it takes on a much larger and more sinister significance than a simple drug trip. In this one field we reach across all of human history, the universe as a whole, and glimpses of the afterlife in what can only be described as a ghoulish nightmare. 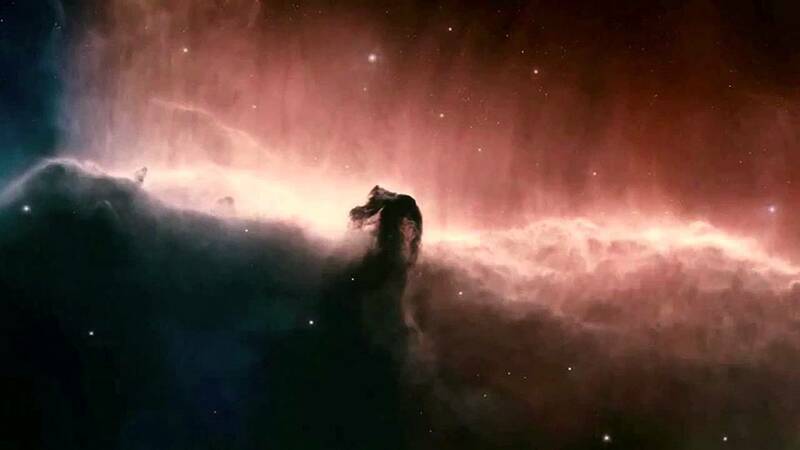 Whatever the explanation is it’s endlessly engrossing and mesmerizing to behold. The kind of beauty on display is a strange one, it can be every bit terrifying as it is divine. But some emotions are a mix of everything in one, just like the scene itself. There’s a lot of beautiful moments in fiction but there’s nothing like the wonders of the real world. The sad truth is that most of us don’t have the privilege of traveling around and experiencing vast cultures. But if anyone is like me at the very least you can have a little piece of it through beautiful works like “Samsara” and relish in the idea of witnessing it firsthand one day. For many of us we’ve come to live very industrialized lives, surrounded by societal norms largely influenced by colonialism and industrialization. And there’s nothing wrong with that. It’s worked greatly for us. But there’s an entire world out there filled with so many rich people we’ve yet to have the honor of knowing. I don’t know if I’ll ever have the resources to experience such rituals myself, but at the very least I can dream a little. And that’s what you get here. “Samsara” as a whole is a film where literally any scene could be argued as the most beautiful, in many ways it’s probably the most beautiful film ever made. But this is the scene that takes my breath away and makes me envious knowing things like this are in the world and I’m not there to see it. “Where were you when I laid the foundations of the Earth?… When the morning stars sang together, and all the sons of God shouted for joy?” This quote from the Book of Job sets up the experiences we’re about to witness in Terrence Malick’s bold film. In the beginning of the film we witness a family tragedy, a son has died in the war and his family is distraught by it. His father feels shame having been a hard father to him, his brother continues to feel grief years after the fact, and his mother finds herself in a Job like depression questioning her faith. The eternal question that’s plagued humanity throughout the ages is ‘why does God allow bad things to happen?’ Much like in the Book of Job the answer to this question can never come in any sort of direct way or run of the mill sermon, it can only be perceived by taking in the broadest strokes possible to attempt to see things from a much larger perspective. Through this sequence Malick plays the role of God taking us on a journey through the puzzling beauties of the universe and our world. We see galaxies created, planets formed, life created, cells evolved, and throughout all of it marvel in the poetic lyricism of it all. The most beautiful sights and experiences are those that make you see a larger world around you, to change your views and the way in which one perceives everything. “The Tree of Life” gives all of us that gift.